The Truthy project was misrepresented in ‘The Kelly File’ and several other Fox News broadcasts. Public domain photo by MattGagnon via Wikimedia Commons. For the past four years, researchers at the Center for Complex Networks and Systems Research at the Indiana University School of Informatics and Computing have been studying the ways in which information spreads on social media networks such as Twitter. This basic research project is federally funded, like a large percentage of university research across the country. The project, informally dubbed “Truthy,” makes use of complex computer models to analyze the sharing of information on social media to determine how popular sentiment, user influence, attention, social network structure, and other factors affect the manner in which information is disseminated. Additionally, an important goal of the Truthy project is to better understand how social media can be abused. Since 25 Aug 2014, when a first misleading article was posted on a conservative blog, the Truthy project has come under criticism from some, including The Kelly File and Fox and Friends broadcasts by Fox News on 26 and 28 Aug 2014, who have misrepresented its goals. Contrary to these claims, the target is the study of the structural patterns of information diffusion. For example, an email sent simultaneously to a million addresses is likely spam, even if we have no automatic way to determine whether its content is true or false. The assumption behind the Truthy effort is that an understanding of the spreading patterns may facilitate the identification of abuse, independent from the nature or political color of the communication. While the Truthy platform provides support to study the evolution of communication in all portions of the political spectrum, it is not informed by political partisanship. The machine learning algorithms used to identify suspicious patterns of information diffusion are entirely oblivious to the possibly political partisanship of the messages. Read the facts below for a primer on Truthy. More detailed information can be found on the Truthy website and in our publications. 9/3/2014: David Uberti wrote an accurate account of recent events in Columbia Journalism Review. 10/18/2014: Unfortunately, the smear campaign against our research project continues, with unsupported allegations echoed in an misleading op-ed by FCC Commissioner Ajit Pai, who did not contact any of the researchers with questions about the accuracy of his allegations. 10/22/2014: Amid news reports that the chairman of the House Science, Space and Technology Committee initiated an investigation into the NSF grant supporting our project, read our interview in the Washington Post’s Monkey Cage setting the record straight about our research. 10/23/2014: While the House Majority Leader joins the fray, IU releases a statement in support of our work. 10/27/2014: Some accurate coverage of the controversy appeared in Physics Today, Motherboard, Motherboard, and Indianapolis Star over the past few days. 11/3/2014: Jeffrey Mervis covers the controversy about this project in Science. We also provided additional information about our research in a slide deck embedded at the bottom of this post. 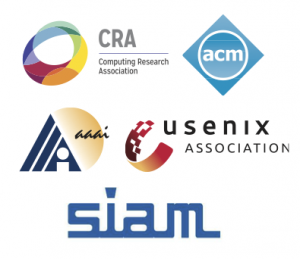 11/4/2014: Five leading computing societies and associations (CRA, ACM, AAAI, USENIX, and SIAM) wrote a joint letter to the chairman and the committee ranking member of the House Committee on Science, Space, and Technology expressing their concern over mischaracterizations of our research. 11/7/2014: Over the past few days we have seen more coverage in Computer World, The Hill, Information Week, and Science about the reactions of the computing and science communities to the Truthy controversy. 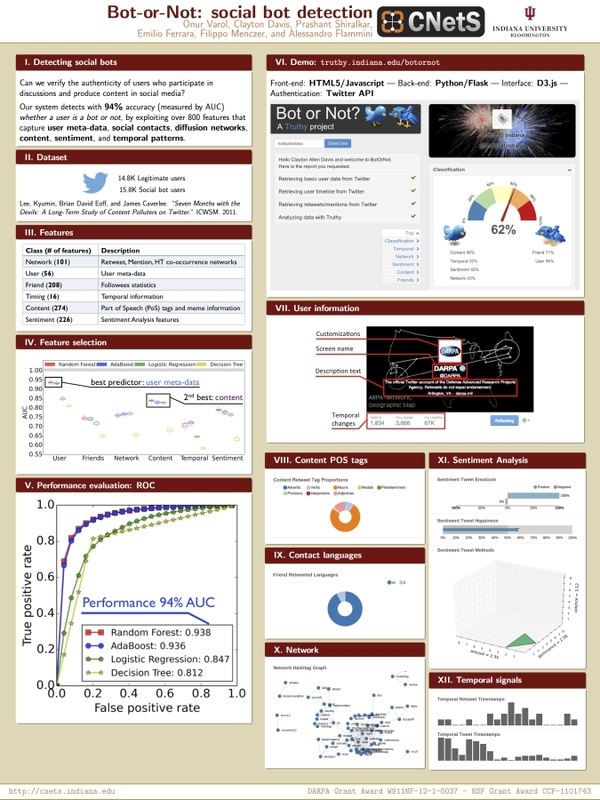 11/11/2014: The House Science Committee Chairman sent a letter to the director of the NSF on November 10, stating that our grant “was intended to create standards for online political discussion” and that a web service developed under the grant “targeted conservative social media messages.” These allegations are false, as we have explained in this post, in the slides embedded below, and in our publications — including the one quoted in the Chairman’s letter. On the same day, the Association of American Universities released a statement on the grant inquires by the House Science Committee. 11/21/2014: False rumors about our research continue to be spread. Some of the questions we have received suggested that our two separate project and demo websites were generating confusion, so we merged them into a redesigned research website with information and highlights about the research project, publications, demos, data, etc. 11/25/2014: Rep. Johnson and Rep. Lofgren, respectively ranking member and member of the House Committee on Science, write a letter to the committee chairman, Rep. Smith, in response to his accusations. Truthy is an informal nickname associated with a research project of the Center for Complex Networks and Systems Research at the IU School of Informatics and Computing. The project aims to study how information spreads on social media, such as Twitter. The project has focused on domains such as news, politics, social movements, scientific results, and trending social media topics. 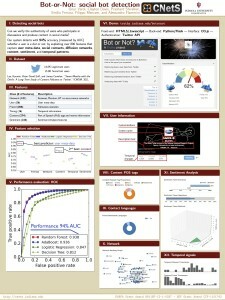 Researchers develop theoretical computer models and validate them by analyzing public data, mainly from the Twitter streaming API. Social media posts available through public APIs are processed without human intervention or judgment to visualize and study the spread of millions of memes. We aim to build a platform to make these analytic tools easily accessible to social scientists, reporters, and the general public. Examples of research to date include analyses of geographic and temporal patterns in movements like Occupy Wall Street, societal unrest in Turkey, the polarization of online political discourse, the use of social media data to predict election outcomes and stock market movements, and the geographic diffusion of trending topics. On the more theoretical side, we have studied how individuals’ limited attention span affects what information we propagate and what social connections we make, and how the structure of social networks can help predict which memes are likely to become viral. Hundreds of researchers across the U.S. and the world are studying similar issues based on the same data and with analogous goals — these topics were studied well before the advent of social media. In the US these research efforts are supported not only by the NSF but also by other federal funding agencies such as DoD, DARPA, and IARPA. The results of our research have been covered widely in the press, published in top peer-reviewed journals, and presented at top conferences worldwide. All papers are publicly available.